Jayne Ozanne contacted me a few months back, asking if I would contribute to a resource she was preparing for the CofE General Synod. 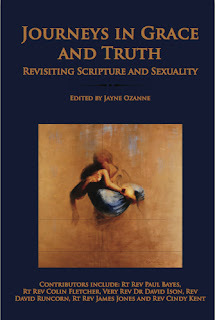 The Synod will be discussing human sexuality in July, and Jayne wanted to offer a book for all members that came from Evangelicals who (through their encounter with Scripture) held different views than those who normally hold the airwaves with what is called the 'traditionalist' standpoint. Evangelicals who support gay people. Evangelicals who support gay relationships. Evangelicals who can find a place for gay people in the Church of God and the heart of God without having to use the word 'sin' somewhere in that place, and without having to throw their Bibles away either. I find myself in exalted company - the press around the book launch has focussed on the bishops involved (the Bishop of Liverpool and my own area bishop in this diocese, the Bishop of Dorchester), as well as other very public church figures. I have been delighted to receive emails, texts and messages from folk who have read the book already, and I'm pleased to say they have been very positive about my few words. I must add that as I read it, I especially enjoyed Gavin Collins' chapter - he very much uses Scripture in a way that I appreciate - though the breadth of the book is excellent, and I do think it helps give a depth to the debate by re-framing the Evangelical perspective away from the one-dimensional 'traditionalist' stance. Judge for yourself. You can find it on Amazon, or direct from Jayne.